The ECLIPSE 90i is optimized for the capture of digital images, providing aberration-free images that have excellent resolution and uniform brightness throughout the view field. The ECLIPSE 90i is a motorized unit that can be operated via a PC, and interacts with the camera controls. Researchers can perform digital imaging automatically while changing observation technique and depth of focus. 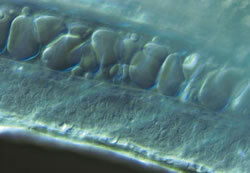 Feedback from a linear encoder showing vertical movement enables high-precision focus control in 0.05um increments, and facilitates high-resolution deconvolution, confocal and other techniques. 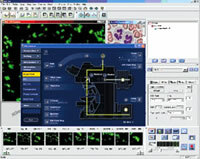 In addition to motorized control using buttons on the microscope, it is possible to control the ECLIPSE 90i and check the status of the objective and other settings via the GUI of Nikon's iControl software running on a PC monitor. By using the optional Ergo Controller, researchers can adjust focus and move* the stage as if seated in front of and operating the actual microscope. *When an optional motorized XY stage is mounted. The aperture and field diaphragms, ND filter, and other units are automatically set to the optimal position following a change of the objective. The travel speed of the motorized stage* and focusing speeds are also altered automatically in accordance with the objective's magnification. Auto link focus automatically corrects deviations in parfocal distance between each objective after the objective is changed, eliminating the bother of focus adjustments. Complicated procedures for changing observation technique, such as from DIC to epi-fluorescence, are a thing of the past. Now, changes can be made automatically by clicking the desired technique on the GUI of a PC monitor. Setting preferences can also be registered for each individual user, and quickly recalled anytime. It is possible to boot the iControl software with a mouse click on the GUI of the ACT-2U camera control software. 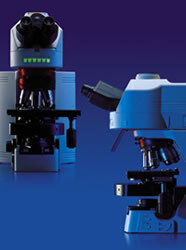 This enables the control of imaging in synchronization with the microscope operation. 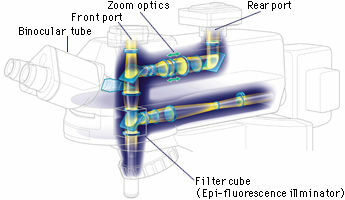 It also facilitates imaging while changing the depth of focus and epi-fluorescence filter, or time-lapse recording that is carried out by changing the technique. In configuration with a Digital Sight-series digital camera, the system automatically uses the image's contrast information to enable auto-focus image capture under the brightfield method. 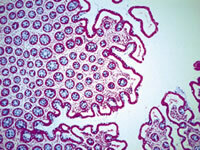 The camera automatically records the microscope settings, including the objective magnification and fluorescence filter in use, as a text file along with the captured image, increasing the efficiency of managing the history log of the images. A revolutionary "fly-eye" lens array built into the transmitted-light illumination optics delivers illumination with uniform brightness throughout the visual field-perfect for digital imaging. Plan Apo VC objectives successfully correct chromatic aberration up to the edges of the view field to create digital images with excellent resolution and uniform brightness- afeature perfect for tiling the captured images. These objectives are also suitable for confocal microscopy as they correct axial chromatic aberration even at the h-line (405nm). Nikon's revolutionary Noise Terminator eliminates stray light inside the filter cube to achieve a signal-to-noise (S/N) ratio five times that of Nikon�s previous fluorescence system. This enables weakly fluorescing specimens to be captured with greater clarity, brightness, and dynamic range. The optional Excitation Balancer can continuously change the spectral intensity of each excitation wavelength of a multistained specimen. The prism in the new DIC system is made of a material of a new composition. This contributes to the creation of high-contrast DIC images with excellent resolution and uniform coloration regardless of which magnification is selected. Nikon has developed two types of digital-imaging heads integrating a Hi S/N epi-fluorescence illuminator, binocular eyepiece tube, dual ports, and optical zoom, into a single unit. When used in combination with a Digital Sight-series digital camera, researchers can check status data, such as fluorescence filter in use, zoom magnification and optical path, on the monitor. As data can be recorded with the image file, this feature is extremely convenient for managing the histories of large quantities of images taken at different settings. The motorized model DIH-E can be operated from a PC, while the manual DIH-M comes with a motorized control specifically for the excitation light shutter.